When I was speaking with Chad Murawczyk of Min New York, one of the things I told him I admired about his store was its openness and how it was refreshing given the fragrance industries close door policy and the snootiness of retailers. I truly feel social media has begun tearing these walls down and consumers are becoming more educated about their preferences. 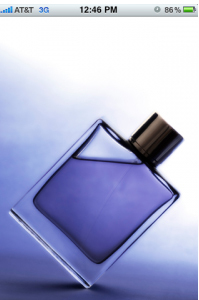 It is for this reason I’m excited about the launch of Givaudan’s iPerfumer. So how does it work? Users, down load the app and are run through a series of questions ranging from gender, age, geographic location, etc and then rate their favorite fragrance families, Oriental, Chypre, Citrus, Woody, Floral, and Fougere. I’m curious who will download this app more, men or women. Women have no problems sampling but guys still seem to have issue with walking into stores and openly spraying themselves or engaging anyone from the sale staff without being nudged. Perhaps this will change that. For a first hand review of iPerfumer, check out Harry Sheff over at Cocktails & Cologne.